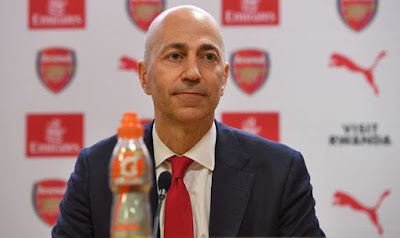 This week Ivan Gazidis has announced he is going to give up being the chief executive of Arsenal Football Club to join AC Milan. He is due to take up the role on 31st October 2018. Back in November 2008 Gazidis accepted the post of chief executive of Arsenal, a post he formally took up from 1st January 2009. He succeeded former managing director Keith Edelman and was expected to take over many of the roles formerly undertaken by ex-vice-chairman David Dein. In 2017–18, he oversaw significant personnel changes at the top of the club in preparation for then manager Arsene Wenger's departure, which was announced in April 2018. Upon announcing his departure, it was revealed his successors would be Vinai Venkatesham as Managing Director, and Raul Sanllehi as head of football. On a personal note, few people in this world make a difference. Gazidis actively backed the creation of the UK’s first LGBT+ football fans group Gay Gooners , he pioneered Stonewall's Rainbow Laces campaign with a prime time advert of AFC players and he’s led Arsenal For Everyone proactively. Thank you Ivan Gazidis. Well played. Arrivederci.